We are celebrating the 100th anniversary of our popular hotel barge L’Art de Vivre. The luxury 8-passenger vessel cruises the Burgundy region of France, but started life in 1917 carrying munitions to the Allied troops on the Western Front during World War One. After many “career” changes, she is now a hotel barge that embodies the Burgundian “good life,” with en suite cabins, an elegant saloon where guests enjoy fine wines and gourmet meals, a spacious sundeck with a jacuzzi, and bicycles to explore the ever-present towpath and surrounding countryside. Many of our hotel barges have enjoyed colorful lives like L’Art de Vivre. It’s all part of the immersive experience we offer our guests, who soak up the historical, cultural and culinary lore of the region as they cruise gently and in comfort. At 100 years of age, L’Art de Vivre may be our ‘Grand Dame,’ but she’s as spry as ever! Like all vessels in our fleet, everything about her has been expertly upgraded and modernized by skilled craftsmen and designers, so that today she offers the ultimate in modern convenience and style. We look forward to toasting her centenary with our guests in 2017, perhaps with a glass of Napoleon brandy? L’Art de Vivre boasts a fascinating past that includes a series of name changes throughout the years evocative of alcoholic spirits. She was originally christened Marie Brizard after the 18th century creator of Anisette, the anise-flavored liqueur. After helping to win the war for the Allies, she began delivering barrels of Cognac from Angoulême to Rochefort along France’s River Charente. Name changes over the decades ahead included Cognac, Royal Cognac, Napoleon, Mark Twain, Magellan and Kir Royal. The barge was purchased in 1975 by Florian Waleski, a direct descendant of Napoleon Bonaparte, before finally joining the European Waterways family in 1999 and being renamed L’Art de Vivre. 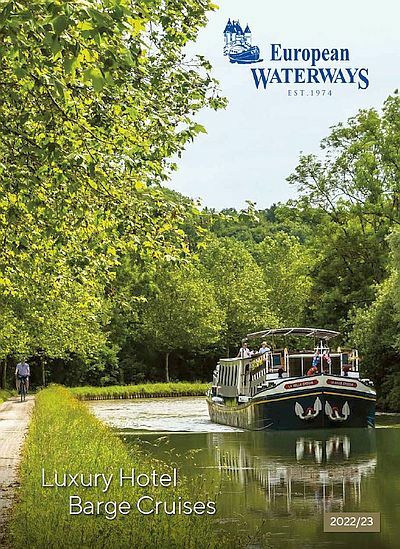 Today, L’Art de Vivre cruises the scenic Canal du Nivernais in Burgundy and guests are pampered by an attentive crew of four – a captain, master chef, tour guide and hostess.